Click to enlargen the poster! Or you can download it here. The Nanowrimo Kick-Off party will be at the possibility room (level 5) of the central library on the 26th October! Don’t forget to actually sign up in the main Nanowrimo website though. The RSVP thread will be out in October. What do we do at kick-offs? We have intro to Nano, quizzes, fun and stickers. If you don’t know how to get to the fifth floor of the central library. You can take a lift, that’s just a video of me taking the escalator and trying to get up there as fast as possible. Starts at 6pm to 8pm but generally for those who have been to the parties know the ‘main’ part of it ends around 7pm and the rest is the major mingling and cake time. 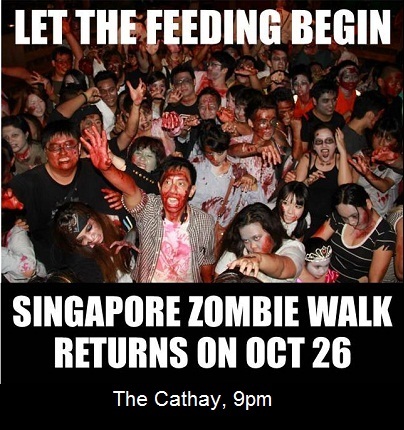 And if you’re not Nanowrimo-ing… JOIN THE ZOMBIE WALK! It’s on the same day but different time! REGISTER here. Get more info on their registraion page! So you guys, technically you can actually go for both events. The kick-off and then the zombie walk. I’m actually going to a zombie race in the morning. Ok, so that means I might be going for 3 events on that 26th. Ahh. 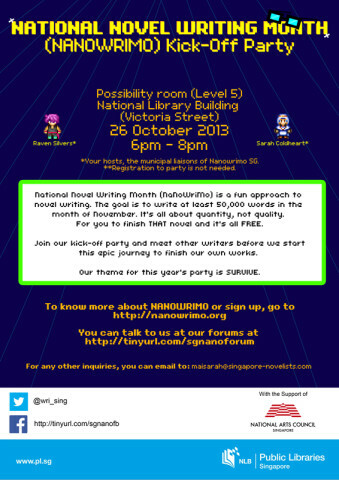 Also, the Nanowrimo kick-off party is called SURVIVE because it sorta goes along with the Singapore Writers Festival‘s theme Utopia/Dystopia. Next Next post: Prepare to race the dead…?